VS1000 is a single-chip Ogg Vorbis (license-free audio codec) player. VS1000 contains a high-performance low-power DSP core VS_DSP4, Nand flash interface, full speed USB port, general purpose I/O pins, SPI, UART, as well as a high-quality variable-sample-rate stereo DAC, and an earphone amplifier and a common voltage buffer. The device also features internal voltage regulators and voltage monitor. 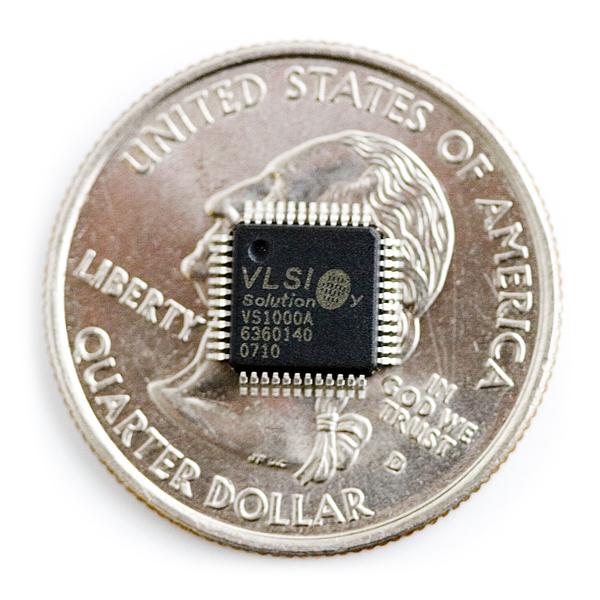 VS1000 can be powered from one supply voltage. VS1000 firmware implements a default player that reads and plays files from the Nand Flash. Only Nand Flash memory, crystal and PSU are needed to build a minimalistic audio player application. The player can be customized or replaced by using boot from Nand Flash. When connected to USB, the firmware implements USB Mass Storage Device protocol or acts as an Audio Device, providing a single-chip USB headphone application. EarSpeaker spatial processing provides more natural sound in headphone listening conditions. It widens the stereo image and positions the sound sources outside the listener's head. SPI EEPROM can be used to load code in applications that do not use Nand Flash. Supports single-level-cell single-chip-select 8-bit Nand Flash devices. Document links seem to be broken..
You guys need to start adding the date that items have been added to the site, and provide an RSS of these items. This is kewl btw. I hope that HTML5 standardizes on open technologies like this for all our sakes.